The Song Of Lunch debuts tonight as a part of PBS' Masterpiece Contemporary series. It will air at 9 p.m. Eastern and Pacific, 8 p.m. Central and Mountain in most markets, but you should check local listings. It’s difficult to criticize something like The Song of Lunch, the latest Anglophilic offering from the folks at Masterpiece, without feeling like a total Philistine. 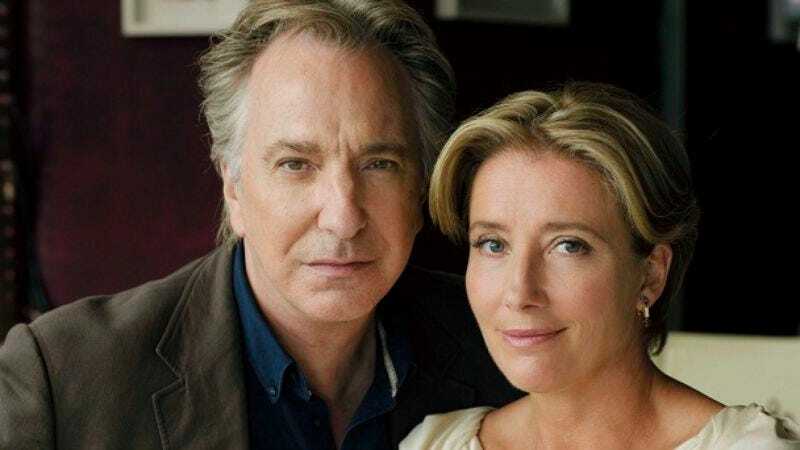 It stars two of England’s most acclaimed and erudite actors, Alan Rickman and Emma Thompson, as two former lovers who share a brief, ill-fated reunion one afternoon over a few glasses of Chianti, and it’s adapted from a celebrated poem by Christopher Reid. Despite its considerable pedigree—or maybe because of it—The Song of Lunch is a strange misfire. They arrange to meet at their favorite old haunt, an Italian restaurant with red-checkered tablecloths and surly waiters. He’s disappointed to discover that it’s been made over into a sleek, Yuppie enclave with white tablecloths and an obsequious staff; she’s relieved. The disparity between their reactions says a lot about the direction of their lives in the years since they last met. We never learn either characters’ names (in the credits they are simply “He” and “She”), nor do we know the pretext for their ill-advised lunch, but over the course of the meal, it becomes pretty clear what drove them apart: He is a bitter, insecure drunk, nostalgic for a past that was never quite as good as he likes to think it was. Perhaps not surprisingly, the best parts of The Song of Lunch are the evocative snippets of Reid’s poetry. He describes the “sneeze” of dust given off by a cracked breadstick and the “jabbing kidney reek” of the men’s bathroom. Reid’s verse is wonderful, but that’s part of the problem: The ever-present poetry makes what’s onscreen seem more or less superfluous, like a televised version of Cliffs Notes. I’m ill-prepared for a conversation about the nature and purpose of poetry, but I like to think that the joy of lines like “a wheel of gluten-smothered dough singed at the rim” is that they create a more vivid image in the mind’s eye than the words “burned pizza.” But The Song of Lunch makes all of Reid’s imagery boringly literal. In case you didn’t understand what Reid meant when he wrote about “plump glistening pasta packet,” we get a close up of a fork stabbing a square of pumpkin ravioli. Where's the fun in that? The endless voiceover is also a serious drag on what little narrative momentum there is in the film. Director Neil McCormick is, if anything, too beholden to Reid’s verse. There are many moments when the camera lingers on Rickman’s face as we hear lengthy portions of the poem in voiceover. Then all of a sudden Thompson’s character will say something and we remember that she’s been sitting there this whole time. Watching The Song of Lunch, I was reminded of the way that actors in sitcoms with live audiences always pause for inordinate amounts of time to allow for laughter. In the same way, Thompson and Rickman have to pause to accommodate all the poetry, and as a result the pacing of The Song of Lunch is stilted, artificial. The poem is written entirely from the perspective of “He,” and The Song of Lunch is also narrated entirely from his perspective. I haven’t read the original poem, but I tend to think that this sort of experiment in voice and point-of-view works much better on the page than on the small screen (or the big, for that matter). Rickman’s voice is a national treasure—second only to Jeremy Irons’, in my book—and if there is anyone I could listen to reciting poetry for close to a full hour, it’s him. Unfortunately, though, Rickman’s character is singularly unpleasant. He’s hostile, egotistical, and resentful even before he’s polished off two bottles of wine. A poem with an unlikable narrator and extremely subjective point of view is an interesting formal experiment; a short film with these qualities is just stifling.